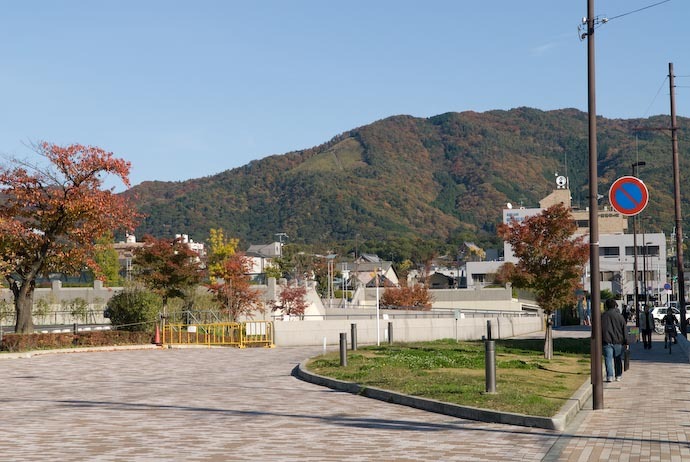 Continuing with the ongoing set of posts on last fall's Mt. Daimonji hike, after having lunch at the top of the mountain, we headed down a bit to the Daimonji hidoko, the Daimonji fire pits. 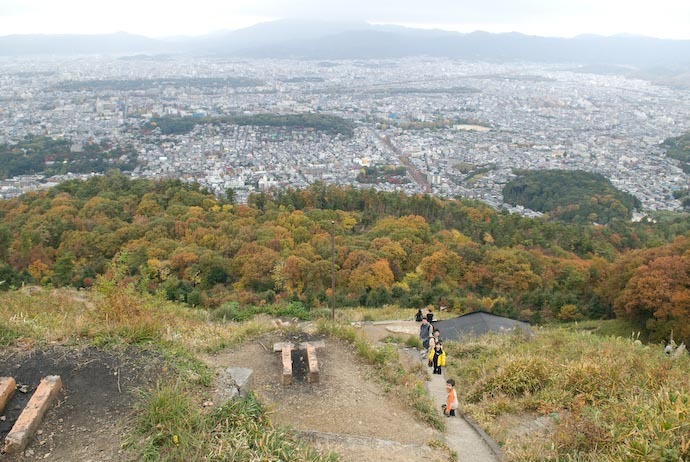 “Daimonji” is also the name of the mountain in Eastern Kyoto that has a big 150-meter-wide daimonji, 大, on it. 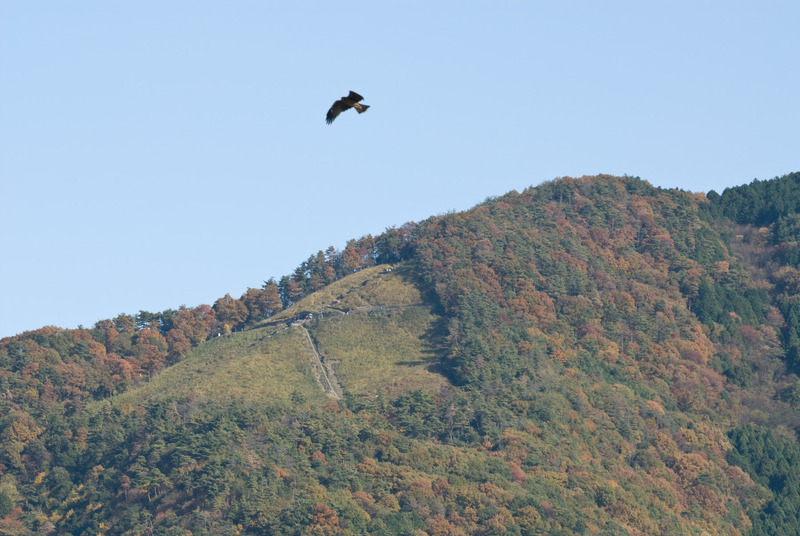 “Daimonji” is also the name of the festival held every year in August, in which this and other symbols on mountains around Kyoto light up in fire. 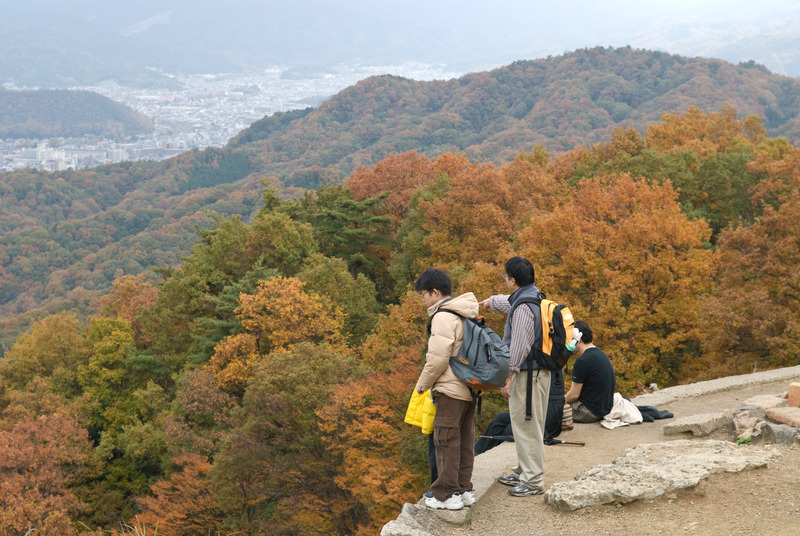 The area where the fires are lit is called the hidoko (火床 — fire pits), and was our destination after leaving the peak of the mountain. The pictures above and below show it from town, from about 2.6km (1.6mi) away. 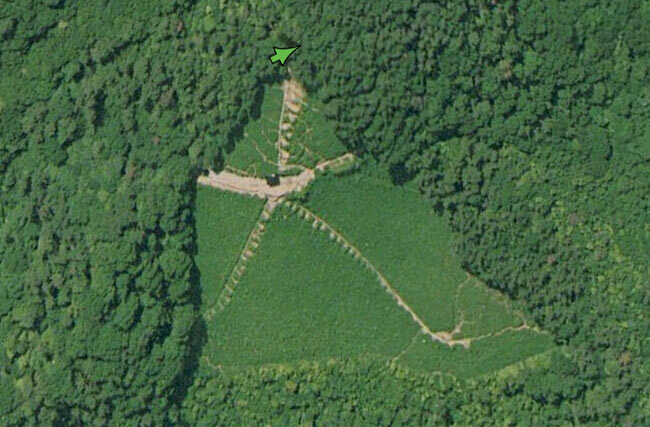 In the view from space above (courtesy of Google Maps), the green arrow at the top shows the location from where the photo below was taken, at the point in the trail down from the top of the mountain that you exit the deep woods and the view of the city opens up before you. It feels much closer to the city than the view from the summit, being 700 meters closer and 100m lower than the summit. The ground just drops away from the entrance point, so as you approach it, you see only the city beyond but nothing up close, so you wonder what happened to everyone who used to be in front of you. It's really an amazing feeling to experience the first time. 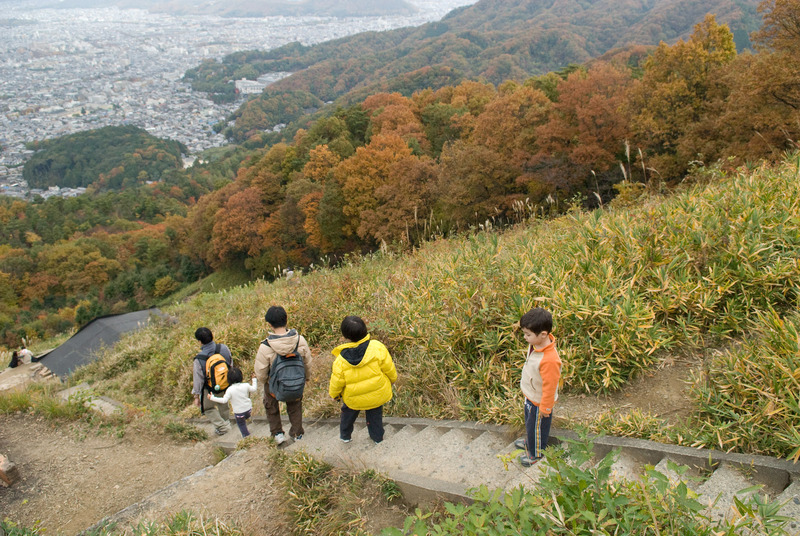 It's very steep, especially right at the top. 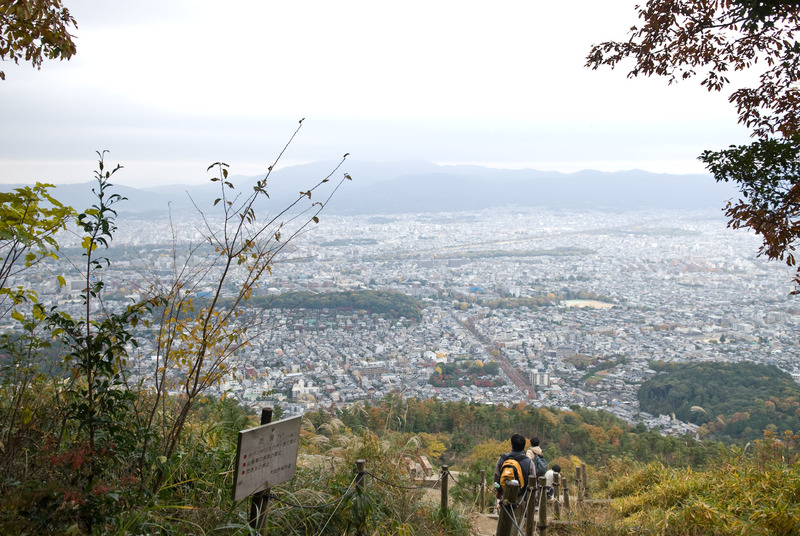 It's probably not particularly steep when compared with some other points along the trail, but it feels so steep because it's a direct, straight route, with no tree cover and a wide sweeping view, and only a narrow set little steps prevents you from rolling all the way down to the imperial palace. Above, you can see two of the many pits used for the fire on the festival night.